Who ever heard of a Bleeding Heart blooming from spring into October? 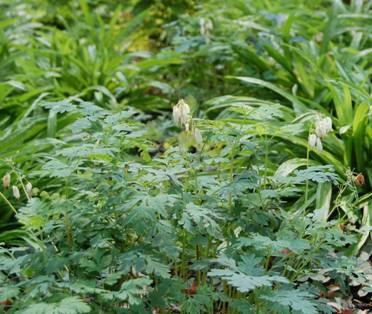 Dicentra eximia ‘alba’ is one of the few woodland wildflowers with such a long bloom time. We recently fell for its long-blooming delicate dangling white flowers when we planted it for a Native Garden at the New York Botanical Garden. Its lush, fern-like foliage interplants easily with native woodland sedges and ferns and makes it a wonderfully versatile plant. 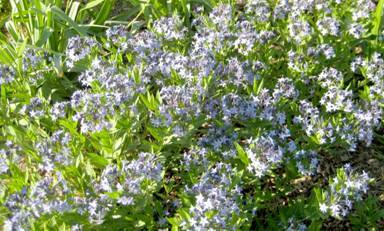 We have also recently paired it with Phlox subulata ‘Emerald Blue’ in the shady interior courtyard of a mixed-use building near the National Cathedral here in Washington, DC. 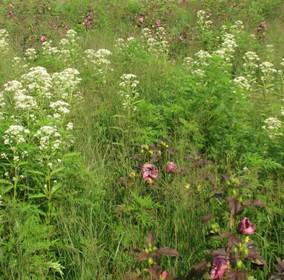 This showy cultivar of one of our regionally native perennials has found its way into several of OvS’ recent gardens. Its large, vivid, plum-colored flowers steal the show when in bloom (July through frost). We were surprised however by its bold-textured purple foliage that is a striking complement to tall ornamental grasses. We planted it recently on a waterfront estate on the northern neck of Virginia, where it contrasts nicely with Panicum virgatum and Eupatorium ‘Bartered Bride’. Swamp mallow is native to the edges of salt marshes and freshwater wet meadows throughout the east coast, but has also found a happy home in the moist, rich garden soil of several of our townhouse gardens. 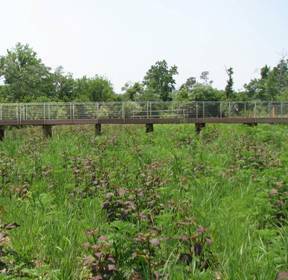 Though best known for its dense clouds of vivid blue flowers in the early spring, this woodland native has proved a beautiful plant throughout the growing season in several of Oehme, van Sweden’s recent projects. Its blue-tinged, finely textured foliage and compact habit make it an excellent companion for woodland sedges and ferns. It also glows an eye-catching golden gold in the autumn landscape. 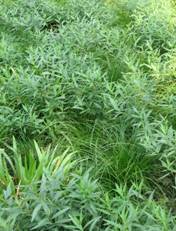 We planted it this spring with Carex appalachicain the new Native Garden at the New York Botanical Garden and are already impressed by its large blue-green sweeps through the dry woodland.